Throughout the nation’s history there has been an overwhelming theme that education is an individual right which is beneficial to the progress and welfare of the nation. Access to sound quality education has been equally viewed as an important codicil of that unwritten policy. Accordingly, the history of our nation is replete with stories such as Abraham Lincoln’s challenges trying to get ahead by studying in a one room school house. Notwithstanding the racial component of segregation, some form of education has been afforded to America’s youth and to a large degree that education has progressively been provide on a free basis. The agrarian period of the nation’s history has cast a lasting spell on education. It has produced the summer recess phenomenon which was brought about for the need to have children available to help with the farming chores. Ironically, northern as well as southern states still participate in that increasingly controversial practice. The 1954 Brown v. Board of Education Supreme Court decision was widely viewed as the corner stone moment in the history of equal education. Prior to that decision, the pronounced racial divide of public education was viewed through the haves and have-nots. African American schools tended to be poorly funded, ill-equipped and in disrepair. Prior to that decision, there existed legendary stories of African American schools relying upon nearby white schools in order to be supplied with the discarded books. The nation was overwhelmingly buoyed with hope that the consequences of segregation would end and all children would receive quality education. However, these feelings were transformed to sustained determination, when the dreams were not quickly realized. Instead of immediate integration, many communities saw the upsurge of the private school phenomenon. In order to avoid integration with blacks, many white parents increasingly sought to withdraw their children from public schools and enrolled them in private schools. Though the private school phenomenon started with a trickle and grew to be an avalanche, the overall view of the public school in America still remained intact. If one wanted and could afford to attend a private school, one would have to pay for it. In essence, the notion of the “free and public school” was still the nation’s concept on standard and desirable. However, there were many attempts to interfere with the primary intent of the Brown v. Board of Education decision. Local education is funded by property taxes. Many whites that where against integration and who could not afford to send their children to private school, tended to move to areas where there were few blacks in residents. As a result, the nation’s real estate industry assisted the untoward parents by inventing and utilizing such discriminatory tools as real estate red lining, zoning and steering in order to create segregated (white only) housing areas. As residents in predominantly white school districts, parents seemed to have their cake and ate it to. Their children were still in public school yet though the discriminatory real estate practices, blacks did not attend their schools. Even this ‘discriminatory bliss’ didn’t last for very long. Due to the litigious determination of civil rights organizations, the advent of anti-segregation busing became a controversial aspect of the equal education dilemma. Busing, along with housing became another battleground in the quest for racial and educational equality. Not only did the initial object of the pursuit of quality education become blurred by racially oriented objections, those objections in and of themselves had constitutional implications. This is because the opponents of busing specifically labeled the attempts to integrate local schools as “forced busing”. The pursuit of quality education for African American children has been a cornerstone in the fight against racism. As noted above, the battle has taken many turns. Among those battles to obtain quality education for black children is the concept of charter schools. Theoretically, charter schools were developed in an attempt overcome the alleged inadequacies of the traditional public schools. News headlines are abound with the reports of crime, incompetent teachers and administrated malfeasance in public schools. Charter schools were developed to provide inner city children with an alternative to the public schools. However, charter schools are technically private schools that primarily require public funds in order to operate. It is not enough that charter schools must exists by utilizing tax payers funds. Many of those schools exists inside of the physical buildings of established public schools. The private nature of charter schools, lends itself to the capacity of those institutions to acquire many amenities that are unattainable by public schools. This tends to render public school children to be in a subservient position. Often public school students are able to visibly see the charter school students utilizing facilities, supplies and other comforts which they do not have. 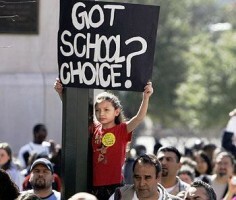 Not all children qualify to attend a charter school. Some require a lottery system. Others require an entry exam or some other qualifier in order to achieve acceptance. This is nothing more than the resumption of the ‘have and have-not’ mentality which is reminiscent of segregation. The only difference is that sadly, the charter schools tend to pit minorities against minorities. The CBS program “60 Minutes” periodically airs a segment in which a multimillionaire has adopted an inner-city charter school dedicated to excellence in educating minority children. There is no inherent problem with individual quests to improve the lives of children. It is only when the rights, hopes and dreams of ordinary public school children are weakened that facilitates a fiscal problem. The existence of charter schools is an anomaly to the established goals, traditions and concepts of education in America. If charter schools are to exist, they must be paid for completely with private funds. If tax payer’s facilities are utilized by charter schools, they must pay the commercially appropriate rate rent. The current political environment has fostered attacks on public schools. The Tea Party, as well as many with in the right wing of the Republican Party, are against any form of government, notwithstanding any established governmental educational entity. As it relates to education, charter schools falls within the mantra of the grand ole party (GOP). However, it is refreshing to see that New York City Mayor, Bill de Blasio is a fierce opponent of charter schools. He fought a battle against charter school maven Eva Mascowitz, who reportedly earns $500,000 and who sought public funding and support in the city budget for her charter schools. Unfortunately, the political nature of the charter school problem empowered New York Governor Cuomo to intercede with the requested funds. Nonetheless, it is reported that anti progressive acts such as the latter has negatively affected Cuomo’s poll numbers with the progressive wing of the Democratic Party. As a result, the battle continues. It is also important to note that in this instance, charter school proponents (including Eva Mascowitz) appeared to engage in a multimillion dollar advertising campaign aimed discrediting the opposition of the mayor. The nature of charter schools goes against the best interest of all public school children. The inadequacies of the public school system must be addressed. The rehabilitation of the public school system cannot be accomplished by redirecting the necessary tax payer funds into the charter school system. Charter schools may seek to help some inner city children. However, statistics relating to their achievements are mixed at best. Most importantly, any success of the charter school system is at the cost of the children that attend public schools. Author: ASPA member William Carr, DPA, has 40 years of public agency experience, 20 years in a court executive position, primarily in the New Jersey judiciary. Carr retired in 2008 as assistant chief probation officer of the New Jersey Superior Court, Probation Division, Essex Vicinage. Currently he is adjunct professor of criminal justice of Essex County Community College and a fellow of the Institute of Court Management (Williamsburg, Virginia).Carr is treasurer and newsletter editor of the New Jersey Association of Criminal Justice Educators. He is also a licensed clinical social worker in the State of New Jersey. He can be reached at [email protected] and followed on twitter at @yllib1234.